Let’s talk over a table top that is as creative as your ideas. Our table top printing provides you the option of customizing furniture for a variety of residential and commercial spaces so you can use logos, graphics or photographs to create a stylish table top. 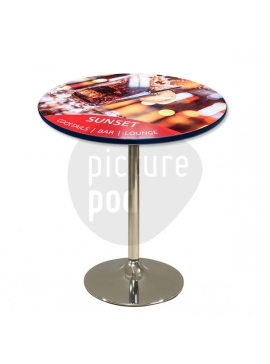 Dye sublimation printing permanently fuses images directly on the tabletop making them perfect for indoor/outdoor use. These table tops (available with or without a base) are specially coated using semi-gloss coating to resist moisture, scratches, and stains while providing a vibrant image of exceptional quality. 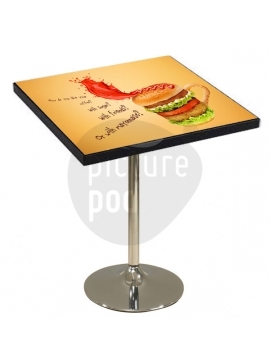 Boost the appeal of your custom printed table top by mounting it on premium metal chrome or black metal powder coated base and display them in style. These easy-to-assemble and durable stands are the perfect base for your custom printed table top.